Every Sunday from 11am to 12pm, our e-board members meet in Campus Center 1010-1015 to discuss important club matters and plan future events. While these meetings are not mandatory, we encourage our members to attend and participate in the conversation. Join us every Wednesday from 8pm to 11pm in the SAU Davis Room. 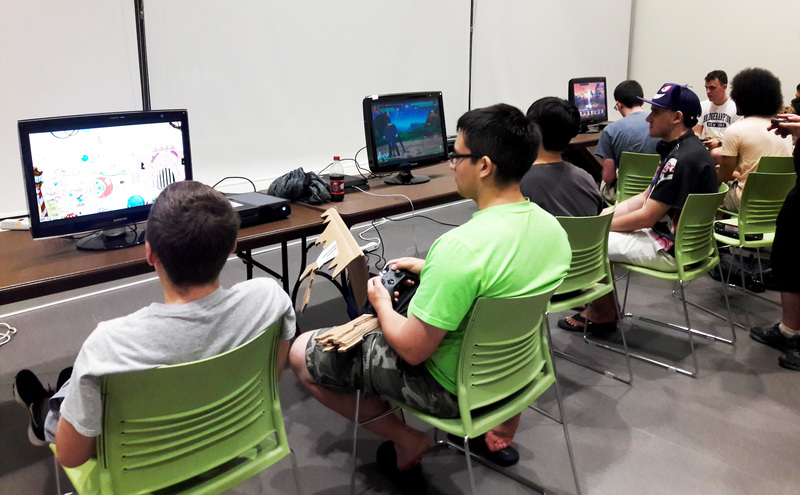 Each week we set up a bunch of our consoles with our favorite games for everyone to play. We also have a different game featured each week that we project on the big screen. Have a suggestion for a feature? Submit it here! Feel free to bring your own games and consoles, too. We have plenty of TVs to spare! Our monthly events take place once per month. These events are typically paid-entry with food and prized tournaments. The games we play at these events follow a new and unique theme each month. Have a suggestion for a theme? Submit it here!